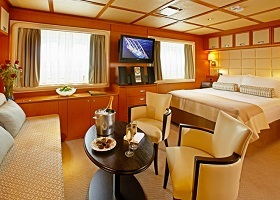 Every inch of your stateroom is designed for comfort. Luxurious Egyptian cotton linens wrap you in pleasant sleepiness as you stretch out in your queen bed (can be separated into twins if you prefer). Your spacious bath features granite counter tops, ample storage, and a roomy shower with massage shower head. 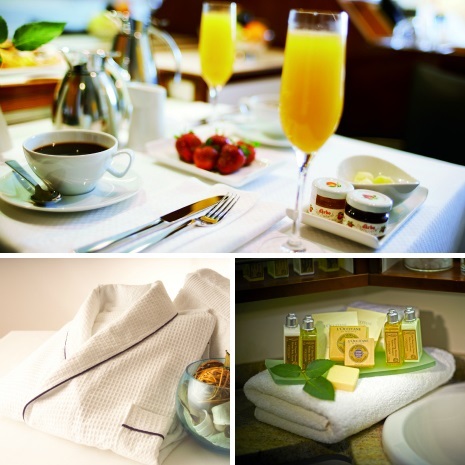 L’Occitane® bath products invite you to indulge, while comfy waffle-weave robe and slippers entice you to relax. You’ll find fresh fruit and flowers always waiting for you after a day of sun or sightseeing. 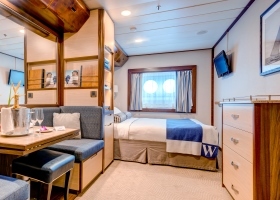 And, of course, everything else you need and expect — flat-screen television and DVD, private safe. And always at your fingertips, anything you wish from room service.